Georgetown Prep will play rival Landon for the IAC Championship on Saturday. BETHESDA, MD - Georgetown Prep, (#1 Seed,) and St. Stephens & St. Agnes, (#3 Seed,) took two days to complete their IAC semi-final lacrosse match, and when all was said and done, the higher seed was victorious 10-6 at home in Bethesda. The two day affair was interrupted on Wednesday afternoon by thunderstorms at the end of the first quarter. At the time St. Stephens led 3-2 with momentum, but when the two conference rivals continued the final three quarters on Thursday, Prep came back strong and controlled the game throughout. In the first quarter on Wednesday, St. Stephens jumped out to a 2-0 lead over their sluggish counterparts. Prep would cut the margin to one with a goal from Nick Perfido, making the score 2-1. St. Stephens would answer right back as the team's leading goal scorer, David Solomon, would once again give the team a two goal advantage. Pat Glading would answer right back for Prep, to make the score 3-2, as the stunned home crowd would be forced to take cover from the ensuing downpour. The game would be called and the two teams learned that they would conclude the final three quarters the following day. St. Stephens had started strong and surely held the advantage in momentum between the two teams. When Thursday came around it did not take long to find out which team was going to take control. Prep attack player, and face-off man, Bobby Gribbin, cradled a bouncing ground ball near midfield and took off towards the net. Gribbin faced an on-coming triple team as he neared the crease, and smartly whipped a pass over to his cutting teammate Mike Pirone. Pirone ripped a shot into the back of the net to tie the score only 27 seconds into the second quarter. The pumped up Prep sideline could sense a chance to grab the momentum. A little over six minutes later, Pirone, would give his team the lead with his second goal of the game, this time off a quick feed from teammate Pat Glading. The score was now 4-3 Prep, and there was no looking back for the nationally ranked squad out of Bethesda. From the start of the second period on, it was the defense for Prep that truly dominated. The defense, led by defensemen Robert Posniewski, Greg Perraut, and Alex Blonsky, and supported by midfielders Matty Collins and Taylor Morgan, was stifling. St. Stephens struggled throughout the remainder of the second quarter to get a good look at net. With less than two minutes to play in the half, it was Bobby Gribbin again making a run at the goal. Gribbin twisted around the side of the net and dove low, releasing a soft placement shot as he fell to the ground. The ball found its way into the net to give Prep the 5-3 lead at the half. Prep had outscored St. Stephens 3-0 in the period, and it was clear, as the two teams huddled for halftime, which side was the more confident bunch. The Prep sideline roared as the horn sounded to end the second quarter, with players chest bumping and high fiving each other, as they made their way to the team huddle. On the other side of the field, St. Stephens looked shocked that they had let what once looked to be a promising upset, slip away so quickly. Robert Posniewski commented after the game, "Yesterday we came out flat, I don't really know why; today we came out with a different intensity. Coach Giblin gave us a speech before the game, (Thursday) to get us pumped up...If the game was played all on the same day, yesterday, I don't know what would have happened." To start the second half, Bobby Gribbin, gathered a tipped ball in the offensive zone, and fed Matty Collins for a quick strike, only 16 seconds into the half. The score was now 6-3 and that was as close as it would get the rest of the way. Ball possession and smothering defense dominated the entire half for Prep. Long-stick middie Taylor Morgan really set the tone for Prep with huge body hits, several of which were flagged for penalties. Regardless of the penalties, Morgan kept his team's intensity level sky high with his aggressive play, and received a standing ovation from the Prep faithful as he left the game with 12 seconds left. Goalie Ford Martin, only had to make a handful of saves for the home team, but he still managed to make a pair of spectacular point blank stops. Martin was very active all game even without a heavy workload. Several times he was able to step in front of passes by St. Stephens intended for cutting teammates in front of the net. His steady play all game long gave his defensemen the confidence to play aggressively, and to go after St. Stephens with huge body hits. 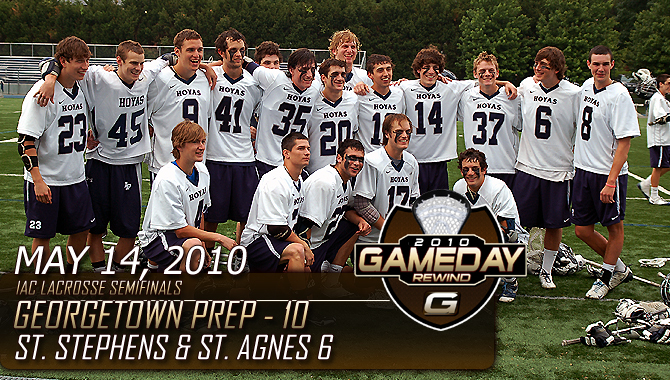 Prep would eventually take a commanding 10-4 fourth quarter lead, before seeing a pair of late goals scored by St. Stephens, to reach the game's final score 10-6. Prep moves on to the IAC finals to face their arch-rival Landon, on Saturday afternoon at 4:30PM. Prep will once again host, as the two teams met three weeks ago, in a defensive battle that ended in a 4-3 victory for Prep at home. Landon flew past Episcopal in their semi-final match by a score of 14-4. The two IAC power teams will meet once again in the championship game, as they have come accustom to. This game will mean everything to both sides, as the winner will hold bragging rights for the next 12 months. Georgetown Prep goalie Ford Martin added, "Were fired up, definitely...Throw the record out for the championship game, we know each other well, it's a big rivalry." Bragging rights are clearly at stake along with the IAC title, but national and local rankings will also be up for grabs when Prep and Landon meet Saturday. Prep, currently ranked by nearly all media outlets as the number one team in the area, has the chance to solidify their place up top, and further their reputation nationally. Meanwhile, Landon would love nothing more than to knock Prep off of its perch among the nation's elite. Expect an intense, big hitting, defensive affair, with a tad bit more scoring than in the first matchup. In a game that will likely come down to the wire, it is the depth of athletes that Prep uses to its advantage this season, which will make the difference. Landon will look to build a lead in order to use a possession attack, while Prep will want to run...run...run until they can wear down their opponent.